KUMEYAAY STORIES Kumeyaay Story Native American Indian Storytellers Portal Pictures Storytelling Photos Tribal Anecdotes Fables Creation Story Cultural Tales Folklore Myths Mythology, Kumeyaay legends of the Ipai Tipai, Diegueno, Cocopah, Havasupai, Quechan, Cochimi, Mohave, Kiliwa, Hualapai YUMAN Language Indians, and SHOSHONEAN language Indians Juaneno, Luiseno, Serrano, Gabrielino, Cahuilla, Chemehuevi Native American stories storytellers of North America, southwest USA, Southern California. PLAYING: Kumeyaay story audio recording in native Kumeyaay language by Mary L. LaChappa in the 1960s, "Orphan Boy." Kumeyaay recording contributed by Daleane Adams (digitally restored by G BALLARD). 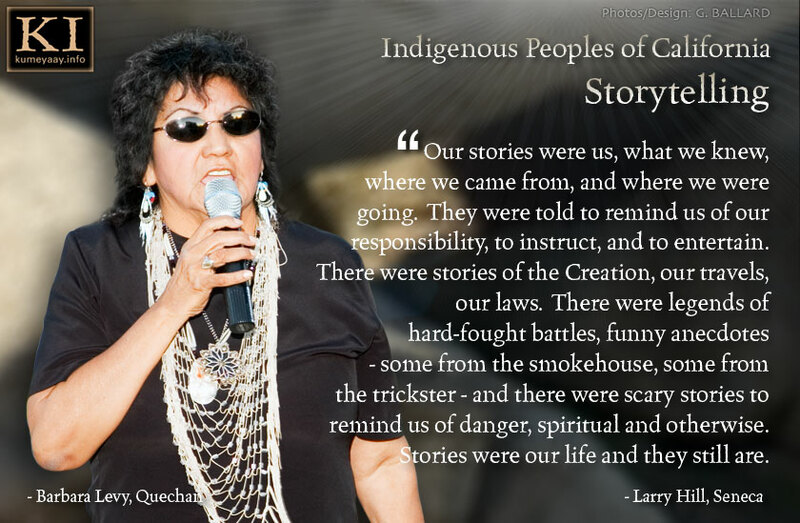 Kumeyaay stories of the Brown-Curo family of Barona and Viejas. FOR THOUSANDS OF YEARS, grandparent, parent and peer storytelling was a part of the Kumeyaay culture where family traditions and morals were passed along by such stories, and many others were told simply for entertainment and humor. There were designated storytellers, who, for a price, would travel the countryside and enthrall inter-tribal audiences for hours telling stories of heroes, adventure, and mystery. Now only fragments of the stories exist, and with fading memories this history is rapidly passing. It is the goal of these sites to preserve as much as possible of what remains. This is an open invitation for any Kumeyaay members to send whatever stories and photographs they have for preservation on these web sites. The stories do not have to be great epics, they can be simple short paragraphs about events in the recent past that offer insight into the culture as it existed only a few years ago. • We can scan your priceless original photographs at your home, and digitally restore them. • We can photograph your priceless original items at your home, caption and catalog them. • We can interview, video tape, and record your oral history, your stories, at your home. These particular Kumeyaay stories are from the Brown-Curo family of Barona and Viejas. WATCH & LEARN how to Speak Kumeyaay Language Videos by Howka Sam on YOUTUBE. Many a legend has been written by the Elders. Here are over 1400 of their stories and teachings, split over eight pages. I have 100's more Native American Legends to add, so please come back and revisit. Thank you and enjoy reading. "Our stories were us, what we knew, where we came from and where we were going. They were told to remind us of our responsibility, to instruct, and to entertain. There were stories of the Creation, our travels, our laws. There were legends of hard-fought battles, funny anecdotes - some from the smokehouse, some from the trickster - and there were scary stories to remind us of danger, spiritual and otherwise. Stories were our life and they still are." -Larry Hill, Seneca: WEBSITE indigenouspeople.net. 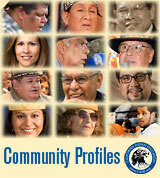 Native American KIDS' stories WEBSITE ihs.gov, US Department of Indian Health Services.